First off, I am not buying a $10,000 sewing machine. Do I want one? Yes, Yes, and Yes. Do I need one? No…. The technology is amazing. I explored the Brother Quattro, the BabyLock Ellisimo, and the new Bernina 830. There is an old Bernina by the same number, which is a little confusing when searching through forum posts. I didn’t get to sew on any machine, just watch. I think it is because the machines are so complicated that at least a mini lesson is needed. Also the dealers wanted to show off the features which is easier to show by doing. I asked tons of questions, though I still have more. The Quattro and Ellisimo are basically the same machine, being manufactured in the same factory. See the photos below. Each comes with different embroidery designs. The biggest draw to the Brother machine is the Disney designs, and the Ellisimo because it is a BabyLock. Babylock makes the best sergers, so it has a reputation for quality. I am not saying that the Brother machines are not the same quality, just the reputation of the company name isn’t the same. #1 Needle camera. This is a robotic feature, at least that is what I am calling it. It will keep the stitching a set distance from the cut edge. It is really cool to watch the machine sew automatically around a curvy edge. It will also look for a sticker to place embroidery. After finding the sticker the computer orients the design to sew exactly the way the sticker is placed in any direction. So hooping doesn’t have to be straight. 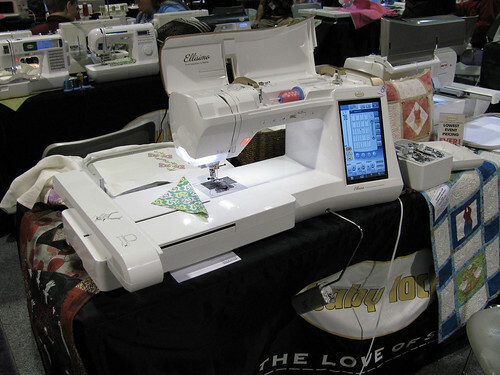 You can also magnify the view and make sure your needle is exactly where you want to start stitching. Great for matching seam lines. #2 There is a manual pressure foot lifter along with the pushbutton lifter and a knee lift. Bernina eliminated the manual lift. #4 Print and Stitch. I think this is only on the Quattro. You can design things where the background is printed on fabric in a printer and then stitch the rest of the design on the sewing machine. The whole composition is visible on the LCD screen. This would be great for fabric Art Journals and ATC cards. #5 Ability to design stitches in the machine. There are 3 USB ports to use. One can be used to hook up a computer mouse to the machine. I think you can use the mouse to choose stitches too, though I am not sure about that. #6 Price. 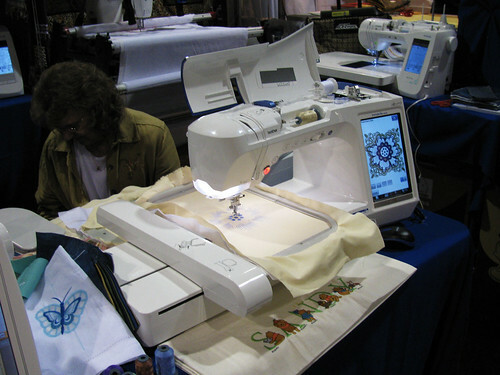 The Quattro was $8,000 at the festival, the Ellisimo was closer to $9000, and the Bernina 830 was $10,000. The reason I call all these machines $10,000 machines is the optional, necessary, design software adds another $1000 to the price. Then there are all the other little notions, like bigger hoops and novelty feet for special effects. #7 Border hoop option. I do not think the Bernina has one. This makes it easy to embroider close to the edge, especially for nice quilting. Might be nice for jacket fronts too. I liked both of these machines, it would be hard to pick one over the other. The Ellisimo had some really pretty embroidery designs but we are a Disney family. I think the Quattro is being advertised as a multi-craft machine. The web site shows how to do paper punching for scrapbooks and card making on the machine. I don’t know it the other machines can de-select the thread awareness and stitch without thread to do that. My 2 quibbles with both machines are a 7mm utility stitch width, I think the Bernina is 9mm, and that the right (10″) “harp” area is 2 inches shorter than the Bernina (12″). I didn’t really talk to the Viking dealers, since I will be working with our local dealer. I did ask the festival price on the Viking Diamond and was told it was $6500. Quite a bit less than these 3 top of the line machines. It is a great machine too. If I was only looking to replace my Elna I would look at the Vikings also. I was more interested in these 3 particular machines. I was curious why they are so expensive. Here are the photos. They are just snapshots, but you can see how similar these two machines look. The Quattro is dark blue on top and the Ellisimo is gold. I think I will call it a day and write about the what I loved about the Bernina 830 tomorrow. This post is a bit long and I feel it is a little more incoherent than usual. I am excited to see all the advancements since the last time I shopped for a sewing machine. This entry was posted on Tuesday, July 28th, 2009 at 3:00 am and is filed under Sewing. Tagged: Sewing. You can feed this entry. You can leave a response, or trackback from your own site. You’re speaking in a foreign language to me! However, I’m sending a couple of friends who sew the link to this entry. I love your take on the machines. I’m not looking in this price range either (it would be great if I could though)!